It's snowing outside right now. I know a lot of you have already gotten your fair share of snow, but here in Missouri we're still waiting for our one big snow of the season. Some years we get it, some years it passes us by. I don't know if this will be "the one" but for now it sure is pretty. This is something I wore to work at ABM last week. It wasn't snowing then... otherwise I wouldn't have chanced ruining my darling booties. You can see my other "Out To Work" getup here. Poe wants to be in the photo too! cutest photo-bomber ever :) You look gorgeous as always Katie! I wouldn't have wanted to change ruining those mocs either. ps, when your kids sneak into your outfit posts, it's absolutely adorable. Your hair is just perfection!! 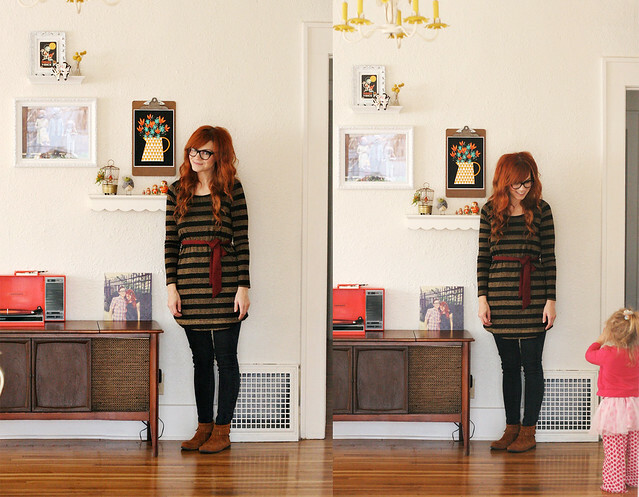 I love the tunic over the jeans - I've been wearing a lot of similar things this winter. I'm in northern Canada and we've got a ton of snow and jeans and a tunic is just such a comfy, cozy combo. I love this outfit! Looks so comfy, but still cute and put together! aww such an adorable outfit, love the gold hint! This is something really simple, but the stripes make it something special at the same time! Its confirmed. I really need a pair of those booties. Tgey would be great for summer and winter. Love love. Love it! The tunic is so cute for everyday! love it!!! you look so cute!!! this is adorable. you look great! Cute! love your outfit! The upside down picture is awesome. Poe is totally a cute photo bomber! Very sweet! I love your hair, such an inspiration! you have such a creative style! I love everything you wear. Absolutely beautiful! I am loving the snow here as well. Except for the fact that it didn't stick enough to make them cancel classes. Love your blog! ps: i might have already told you but man do i love your complexion. your hair is so yum.